Being that it's Labor Day, I would like to dedicate this post to Edgar Cayce. Cayce was one of the first widely-popular, U.S.-born-and-based psychics. He was an extremely prolific clairvoyant who spent most of his life applying his natural talent to help those less fortunate and to allow humanity to gain an alternative perspective on medicine, history, and other sciences. 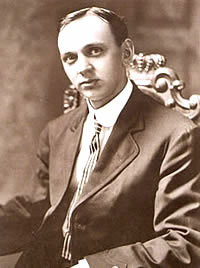 Edgar Cayce was born in 1877 in Kentucky, where he exhibited strange behavior and supernatural powers since he was a child. He gained fame as a young adult, giving medical diagnoses and cures while in a trance-like hypnotic state. During the middle of his life, Cayce also used his powers on more philosophical, historical, and predictive matters. Later in life, he settled in the Virginia Beach area where his fame and serving nature required Cayce to do up to 8 readings a day - it is believed that this rigorous regiment had a detrimental effect on Cayce's health and eventually led to his death. Although Cayce's skills were surely unconventional, paranormal, and potentially baseless, he always considered himself a devout Christian who followed the guidance of God. I was introduced to Cayce and the massive amount of information he left behind at the Edgar Cayce Association for Research and Enlightenment in Virginia Beach. Although I am far from convinced about all of Cayce's claims and instructions, I am positive that he was one of the most interesting, underrated, and hardworking characters in American history.